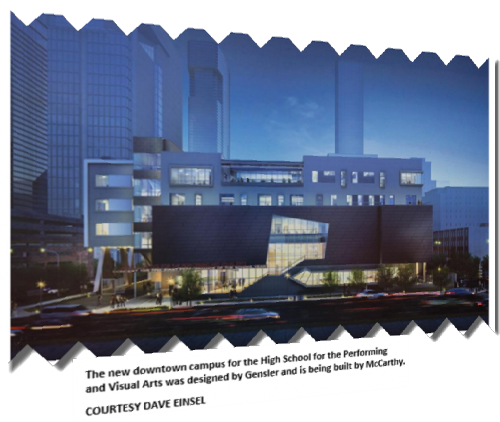 ​​HOUSTON - The Houston Independent School District (HISD) is finalizing a timeline for its art school's new sleek downtown campus. The High School for the Performing and Visual Arts, currently located at 4001 Stanford St. in Montrose, will be moving into its new 168,000-sf facility in downtown at Caroline St. and Austin St. in late 2018. The campus will be built on a 1.32-acre site that HISD has owned for decades. Site work began in February. The estimated cost of construction is $78.7 million, the HISD spokesperson said. The project is being funded through the $1.9 billion in voter-approved bonds that passed in 2012. In total, the school will be five stories and include an 800-seat theater, as well as dance studios, music studios and art galleries. Two levels of underground parking will also be built, as well as an outdoor dining area and a roof terrace near the school's library.